Heat vs Ice, what is the Best Choice when you Suffer and Injury? This question seems to come up all the time when I am dealing with the many bumps and bruises the athletes I work with suffer in their fall sports. The main issues are typically contact related injuries especially football for the obvious amount of contact that comes with the sport. Usually it seems following the more difficult practices and games there are several bruises bumps and bruises. We also will have a few little strains and sprains each sport season and these tend to bring out the many questions. 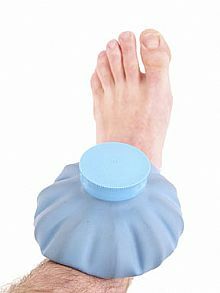 Sprained ankles for example tend to be an immediate cause for ice. I have never been a fan of this because I just trust in the incredible design of the human body and its uncanny ability to heal itself. I feel the body is far superior to any type of tools we use to help speed up the process of healing. When I was still competing in athletics I suffered my fair share of injuries and the common response to everything was to rest, use lots of ice, apply some compression, and in many cases, elevate. This was the standard that was given to me and all my teammates for most of our minor injuries. Occasionally I was also told to try icing for twenty minutes, then heat for twenty minutes every few hours. I was always curious if anyone had a sound reasoning for using ice or heat following an injury. I came across this article on Runnersworld.com. This was very much in line with many other articles i found about this topic. It seems that at the point of an acute injury Ice is your best bet for the first 24 hours. Following that time the combination of Ice and heat will help to provide the best results. So I would like to add one thing to this. As opposed to just relying on the ice to help initiate the healing process lets look at some of the other factors that tend to happen with acute injuries. For a good example lets use a sprained ankle. There are two components that need to be addressed in my opinion. First is why did the ankle sprain? I will not spend a ton of time on this for this post but lets say you sprained it stepping off a curb or maybe while jogging on some uneven terrain. Typically the response would be that the cause of the sprain has to do with the curb or the uneven ground. Completely untrue in my opinion. The cause is a lack of muscular efficiency. If you land on some uneven ground while running and your muscular system is not capable of reacting in a manner that enables your body to absorb the impact evenly into the hips, then your ankle will be forced to take the brunt of the force. This is what causes the sprain, not the ground you landed on. Then the second component is what happens when the joint is sprained? In my opinion it begins to form its own cast around the injury. it does this by creating tightness within the muscular system. This is why when there is a joint sprain the first thing we do is to neutralize the casting by reestablishing the efficiency of the muscles to allow the casting to subside and in turn allow the joint to return to the anatomically correct alignment. This has always made a tremendous difference in swelling and drastically speeds up the bodies ability level to heal itself. So Ice and heat since I have no reason to think these are incapable of helping out some but to truly maximize your healing, allow the body to do the bulk of the work on its own. So are you saying that the greater priority should be addressing the negative side effects of the compensations the body has to go through with an injury, as well as the initial cause of the injury, than simply getting the injury to feel better as quickly as possible? Well Eric I have found that athletes “feel better” significantly faster when addressing the swelling through muscular means than just the typical rest and ice. Taking care of the bodies own casting continues to prove to be the most effective way of relieving pain, swelling, and restoring mobility to the joint.